Riding on the success of 3D cinema blockbusters and advances in stereoscopic display technology, 3D video applications have gathered momentum in recent years. 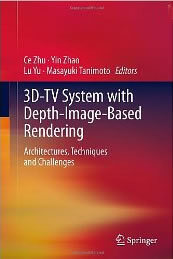 3D-TV System with Depth-Image-Based Rendering: Architectures, Techniques and Challenges surveys depth-image-based 3D-TV systems, which are expected to be put into applications in the near future. Depth-image-based rendering (DIBR) significantly enhances the 3D visual experience compared to stereoscopic systems currently in use. DIBR techniques make it possible to generate additional viewpoints using 3D warping techniques to adjust the perceived depth of stereoscopic videos and provide for auto-stereoscopic displays that do not require glasses for viewing the 3D image. The material includes a technical review and literature survey of components and complete systems, solutions for technical issues, and implementation of prototypes. The book is organized into four sections: System Overview, Content Generation, Data Compression and Transmission, and 3D Visualization and Quality Assessment. This book will benefit researchers, developers, engineers, and innovators, as well as advanced undergraduate and graduate students working in relevant areas.